There's nothing quite as satisfying as filling notebooks full of your personal thoughts, drawings, business plans, poems and more — but when it's time to store those papers, it can create a ton of clutter. The alternative is tossing them — and even if you do recycle, the result is a ton of paper waste. Plus, what happens when you want a way to save and keep your musings for later? Check out this RockBook Erasable Notebook Bundle: it includes two RockBooks and six RockBoards that you can re-use over and over again — plus, you can scan and upload the contents to the cloud when you're done. 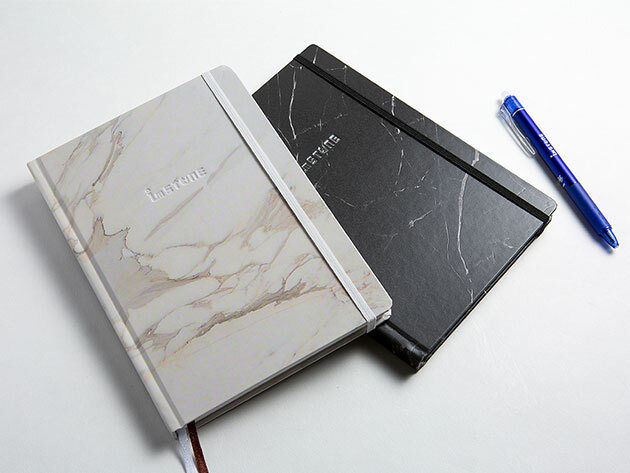 These ingenious, eco-friendly notebooks feature paper made from stone, resulting in a completely smooth writing experience that's tear-resistant, waterproof and mothproof — how's that for longevity? Plus, if you choose to use erasable ink pens, then you can re-use them over and over. This massive bundle includes everything you need to map out your thoughts and get creative, including an A5 RockBook, A6 RockBook, two erasable pens and two packs of A5 and A6 RockBoards. The reusable writing boards are compatible with most scanning apps, so they're perfect to use for mind-mapping or brainstorms that you want to access later. Usually, this RockBook Erasable Notebook Bundle is $92, but you can get it here for $65.